Alaska DeLorme Atlas: Road Maps, Topography and More! Get Alaska's topographic diversity in 126 large pages of shaded relief maps contained in the handy DeLorme Atlas and Gazetteer! The back cover of this atlas has a large map of Alaska with an overlying grid. Each cell of the grid contains the page number for a detailed map of that area. The detailed maps show features, which include: Alaska's mountain ranges, highest peaks, national parks, scenic drives, the Alaska Marine Highway System, rivers, lakes, public lands, trails and back roads. Also included are street maps for Anchorage, Fairbanks and Juneau. There are an additional 15 pages of reference information for Alaska's activities and points of interest. These features include: campgrounds, downhill ski areas, wildlife refuges, float trips, areas for hunting, hiking, freshwater fishing, saltwater fishing, and the state's Visitor Information Centers. 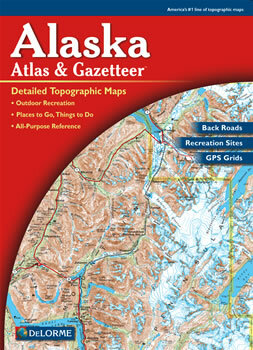 Alaska's place names and physical features, such as lakes, rivers and mountains are indexed for easy look-up. The vastness of the state is detailed in this up-to-date atlas, from the Gulf of Alaska to Barrow, the northernmost point of the United States.